Magic Show Suitcase Just $26.49! Down From $51! PLUS FREE Shipping! You are here: Home / Great Deals / Amazon Deals / Magic Show Suitcase Just $26.49! Down From $51! PLUS FREE Shipping! Amazon has this Magic Show Suitcase on sale for just $26.49 down from $50.99 PLUS FREE shipping! Ideal 100-Trick Spectacular Magic Show Suitcase lets children wow their audiences and amaze even themselves! Learn the great secrets of illusion from one of the most complete magic sets ever made. 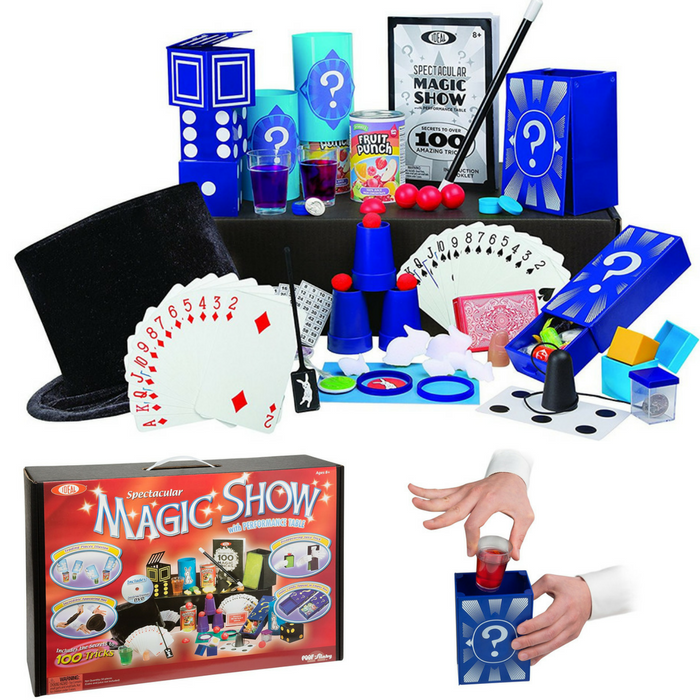 This set comes with a magic hat, magic wand, suitcase that doubles as a magician’s table, props, the “Secrets of 100 Magic Tricks” book and instructional magic trick DVD starring magician Ryan Oakes. Props include a drawer box, 3 plastic cups, 4 fuzzy balls, double-sided lollipop, x-ray color cube and lid, coin box with top, dice escape (3 parts), 3 red plastic balls, red half ball, quarter box and lid, 6 multiplying rabbits, ring, ring with false bottom, rabbit ring mat, rabbit token, spot card, number card, thumb tip, mystery card deck, crazy coin cap, flip box, 2 blue tubes, 2 clear tubes, 2 apple cans, rabbit paddle, color cube, hanky vanisher with elastic cord and double-sided tape. It makes a great gift!